Forget tickets! This arcade game gives you beer! Long before they became regarded as frivolous childhood amusements, the first arcade cabinets were installed in very adult establishments like bars and college hot spots. The marriage of gaming and alcohol consumption is a beautiful thing, so it was only a matter of time before a game came along with the sole purpose of putting beer in your belly. 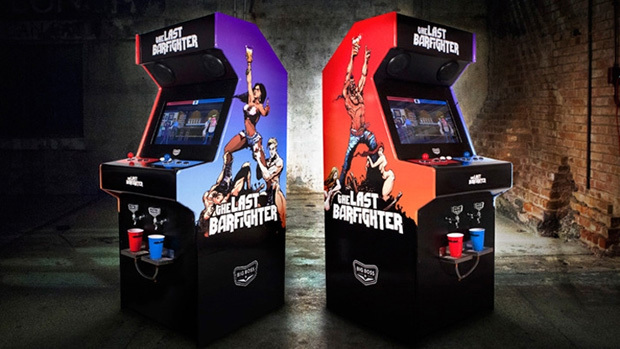 The McKinney advertising agency has recently developed Beercade: The Last Barfighter, a Flash-based fighting game constructed for the Big Boss Brewing Company in North Carolina. Picking from among five combatants named after Big Boss brews, players battle one another for barroom supremacy with the victor getting poured a nice, frosty, free cup of sweet nectar from a tap located right around where bullsh*t tickets would normally spit out. The Last Barfighter itself is more than likely a heaping load of cow dung, but the sheer novelty makes this an attractive experience. Big Boss plans to wheel the machine around to various events, so if you happen to spot one in the wild, jump on it like Apache.